Register any current PreSonus audio interface or mixer and get the Studio Magic Plug-in Suite as a free download in your My.PreSonus.com account! Capture your ideas wherever you are with the PreSonus AudioBox USB 2x2 USB recording system. The AudioBox USB is a USB bus-powered audio recording interface featuring 2 microphone/instrument inputs with 48V phantom power, 2 balanced TRS outputs, and MIDI in/out. The AudioBox USB is bundled with PreSonus Studio One Artist, the groundbreaking music creation program, and over 4 GB of virtual instruments, plug-ins, loops, and samples to get you started making music immediately. PreSonus Audio has won numerous awards for designing the highest quality microphone preamplifiers in the industry at all price levels. The AudioBox USB is loaded with preamps that out perform any USB-based interface hands down. The preamplifiers in the AudioBox deliver high headroom, low noise and high gain giving you pure, full and rich sound. Most USB recording devices operate at 16-bit sample rate and use converters with dynamic range of less than 90dB. This translates into a pinched and relatively small sound. The AudioBox USB uses professional-grade analog to digital converters with dynamic range of 102dB and 24-bit sample rate so that the digital conversion is big, quiet and musical. The AudioBox USB is USB bus-powered allowing you to take it anywhere inspiration hits. No wall warts, line lumps or power cables, just plug in to a powered USB port and you are ready to record. There's no plastic here. The AudioBox USB is housed in an all-metal chassis with metal knobs ready to withstand the rigors of travel. Toss it in your laptop bag and mobilize your music creation and production. Whether you want to record your shows, mix on the plane or write songs in your hotel room, the AudioBox is ready. The AudioBox USB is bundled with an exceptional software package, featuring PreSonus Studio One Artist, the amazing DAW software for Mac OS X and Windows XP and Vista that makes producing high-quality projects easier than ever before. 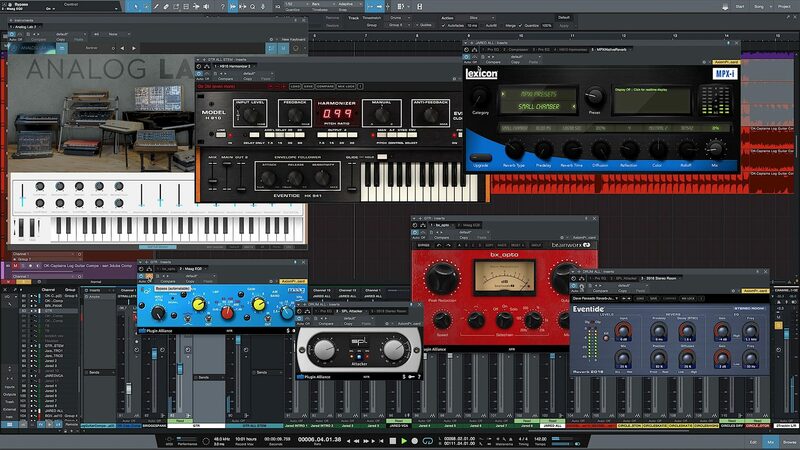 As part of the Studio One Artist package, you get 20 upgraded PreSonus Native Effects plug-ins and virtual instruments and a generous bundle of third-party loops, software, and instrument sounds. - Ability to control the software mixer in any FireStudio-series interface to create zero-latency cue mixes. - Dimensions (WxHxD): 5.5 X 5.5 X 1.75 in. As a commitment to constant improvement, PreSonus Audio Electronics, Inc.reserves the right to change any specification stated herein at anytime in the future without notification. Below are the minimum computer system requirements for the AudioBox USB. Note that the speed of your processor, amount of RAM and size and speed of your hard drive will greatly affect the overall performance of your recording system. Also, a more powerful system (faster processor with more RAM) will allow for lower latency (signal delay) that you might experience while monitoring audio or MIDI signals. "a breath of fresh air to the home studio"
Overall: I have been recording audio for over 30 years, I started out in college learning on an 8 track tape machine and have tried just about every new way of recording since the early 80's. This great little interface and studio one's incredible software has transformed my recording experience, more in the last couple of months than I can put into words in this short review. I recorded my last album on a Roland VS1824 and mastered it to the computer and it turned okay but I can already see that with the tools available in Studio one and the great lil interface my next album will not only done faster but also cleaner and much better resolution, in short a much better product due to the new tools I have.If u are sitting on the fence about a transition from a separate work station or even still using tape to DAW recording than BUY IT and TRY IT I honestly don't think u will be sorry. 36 of 37 people (97.3%) found this review helpful. Did you?